This home offers so much that it's difficult to include it all! An estate with a floor plan that provides privacy and room for all. 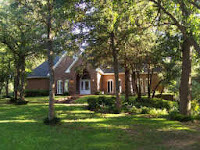 Situated on a wooded 2.5 acre lot in prestigious Hidden Acres that features brick equestrian stables and paddock. Park like ambiance with rolling topography, hundreds of trees, tennis courts and a multi level back yard oasis including a heated diving pool pool and spa welcome you home every time you drive up. A generous master bedroom on the first level provides a stunning view of the tranquil backyard. Relax in the adjoining luxurious master bath featuring a separate jetted tub, steam shower, dual vanities, and a generous closet. Handscraped wood floors throughout invite you into a kitchen perfect in a cook's dream. Ample corian counters allow plenty of room for prep and the island allows room for many. A cozy breakfast area is surrounded by peaceful views of the estate grounds. En suite bathrooms complete the secondary bedrooms located on the second floor. Large rooms and walk in closets allow to grow. Don't forget to take time to visit the separate guest apartment located above the three car garage. Featuring a full kitchen, bedroom, bath, utility room, and central heat and air. Need more room? Visit the downstairs 27x25 gameroom for privacy and convenience. Complete with small wet bar and fridge, access to the outside and enough room to entertain for hours. Features not as visible are not limited to buried propane tank for the gas fixtures, RV hook up and waste disposal, trestle bridge across the creek located on the property, and elaborate automatic underground sprinkler system fed by your own high recovery well. Did you know the Grove Team offers a no cost, no obligation service report called the Market Snapshot? If you have found yourself wondering what the market conditions are around you - this is just the solution you have been looking for! The Market Snapshot provides a general overview of the homes that have sold and are on the market new you. In addition, it also provides you with statistical information on home sales. It is easy to get started - and best of all - it is FREE to you. Click here to get started today! Grove Team has a record year! The Grove Team had a record 2009...closing more than 100 transactions. The members of the Grove Team would like to take a moment to send special thanks to all of our customers, vendors, and affiliates. Without your ongoing support we would not have been able to build our business to what it is today. More than 40% of our business came from past clients and past client referrals. Help us keep the momentum going...if you or someone you know is in need of a real estate professional, give us a call.